Why settle for a single-strand tennis bracelet when you can get four beautiful rows of rhinestones instead? The stretch style eliminates the need for clasps or closures. The silver-tone hardware is smooth against the skin for a comfortable wear. 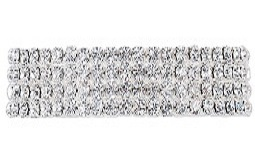 FWO Extras: The approximate width of this bracelet is 1/2 inches wide.